Urbanica, Inc and Urbanica Design are acting as a development and design consultants on this interesting project at the Fenway neighborhood. We hope to replicate the highly successful modern-contextual design formula of 691 residences here at this site. square or angular bay windows in the existing building stock defines the street edge. For 50 Symphony Road, the proposed double bowfront design sensitively captures the rhythm of the neighborhood. The proposed material palette is influenced by the surrounding context. A stone base level, a brick middle level and a metal top level will provide clear definition to the building massing. The use of a decorative window lintel, horizontal textured brick coursings, a rusticated stone base and cornices creates interesting shadows and textures in the facade. The use of the metal panels on the penthouse level as well as the back facade will enable the building to have a “lighter” massing as well as enabling it to blend into the sky. The building is primarily accessed at grade from Symphony Road for accessibility reasons. The vehicular access is located on the back facade (on Public Alley 810). There will be an elevator service with stops on all levels. The first floor residential is around 6 feet above grade, allowing for privacy from the street level view. This is also contextually consistent with the existing “parlor” levels of the surrounding townhouses. overlook the charming Symphony Road Community Gardens. The tower at the corner acts as an architectural “book-end” element, corresponding to the existing turret located at the other end of Symphony Road. By smartly using contextual cues and rhythms, the design of 50 Symphony Road aims to be a subtle contemporary interpretation of a classical bowfront building. 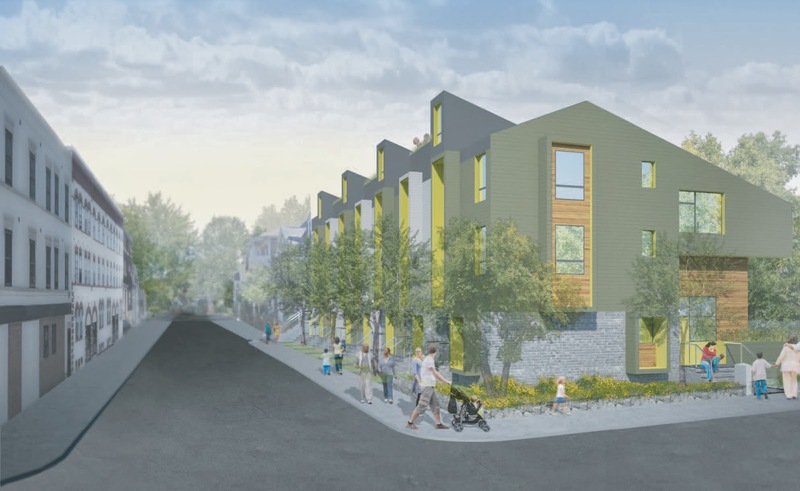 As part of the proposed project, the new 20-units residential building will include on-site parking for 11 vehicles in order to mitigate potential parking and traffic issues. The parking will be directly accessible from Public Alley 810. The project site will be redeveloped with improvements to the vehicular curb cut and pedestrian walkway to assure proper public safety and appropriate design. Additionally, the project’s close proximity to public transportation, including the Massachusetts Bay Transportation Authority (MBTA) stations of Symphony (Green Line), Hynes Convention Center (Green Line) and Massachusetts Avenue (Orange Line) as well as MBTA bus lines 1, CT1, 9, 39, 55, 57 and 170 will help to further alleviate any potential negative impact on parking and traffic as public transportation is clearly in abundance for the new residents. The provisions of bicycle racks (1:1 ratio of bike storage space to residential unit) will promote the use of more sustainable form of transportation and the availability of multiple car-sharing locations within a 1/2 mile walking distance greatly reduces the dependency on automobile. The project site is also easily walkable to major Boston neighborhoods of Fenway, Copley, Back Bay and South End. Furthermore, the proposed project is close proximity to public amenities. We anticipate that the 11 proposed parking spaces provided will satisfy the needs of the residents. Pardon for the lack of posts in the past few months! Been a very hectic year at the Urbanica office. As they say, a picture paints a thousand words, so please check out this short movie on the year-long process for the construction of 226-232 Highland Street at Roxbury, Boston, MA. Please enjoy! On August 27, 2013, Urbanica had a short ribbon cutting event at Highland Park to celebrate the susbstantial completion of the 226-232 Highland Street Energy Positive townhouses. The invited guests include Boston city officials, local elected leaders, home buyers, neighbors, consultants and subcontractors. The team from MERGE Architects has been working hard to come up with a more contextual facade that befits the traditional and historic fabric of the Highland Park neighborhood. We are proud to share some of the new progress images as the design of the project gets refined through the neighborhood approval process.